CLARKSBURG, Ind. — When Carol Holzback last saw Carol Jackson at Clarksburg Christian Church, she was happy: Holding one grandchild, expecting another, shining like the “light for the Lord” she had long represented to her small community. Like her pastor husband, Jerran Jackson, Carol spent 40 years as a well-loved fixture of the church. Her seat will be empty Sunday. Jackson died New Year’s Eve’s after becoming trapped inside her car during a flash flood on Pipe Creek Road, according to police. She was 63 years old. “Of course, we prayed and hoped all night, all day the next day, but they did find her body down the stream,” friend Mike Holzback said. Both Jerran and Carol Jackson were Nebraska natives who attended Cincinnati Christian University, according to Holzback. 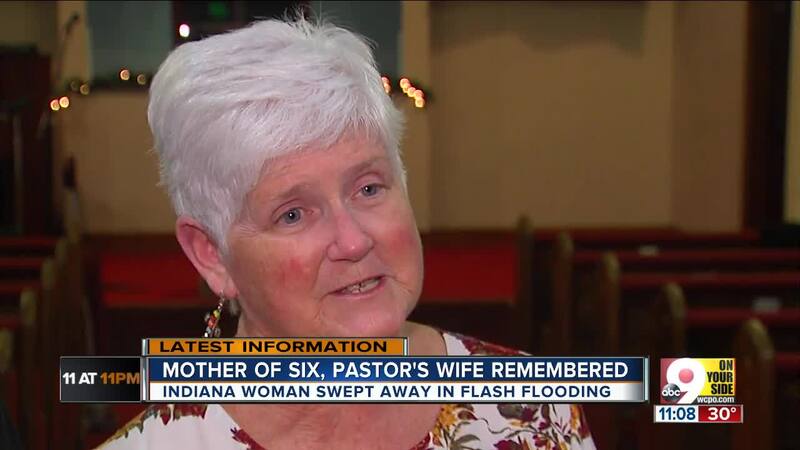 She homeschooled their six children and taught others in Sunday school — many of her husband’s congregants were once her students. Coping with her loss will be a challenge for the 100 people who attend Clarksburg Christian, she added. It will be an even larger one for Jerran. It’s difficult, but Holzback said she saw hope in the way members of the church had acted to help the Jackson family and lean on each other in their mourning. “There’s no way we can fill her footsteps, but we’ll walk in her footsteps and we’ll try to carry on as much of her work as we can,” she said. Anyone wishing to support the family in the wake of her death can donate via GoFundMe.